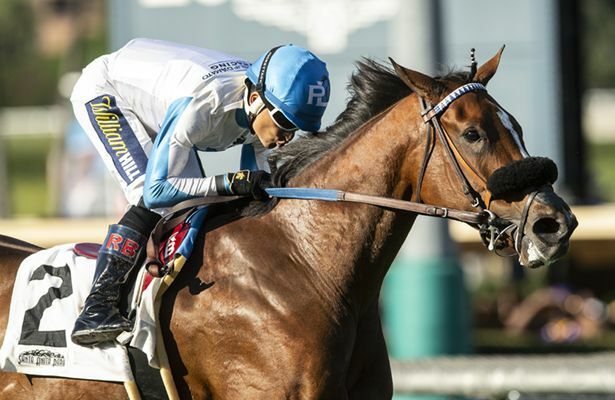 With a fast pace to run at, Storm the Hill was content to lag far back early and ramble late, as she easily overhauled favored Painting Corners to win Saturday’s Grade III, $100,000 Senator Ken Maddy Stakes at Santa Anita by 1 ¾ lengths under Rafael Bejarano. Trained by Phil D’Amato, the 4-year-old daughter of Stormy Atlantic got 6 ½ furlongs down the hillside turf course in 1:12.13. Next to last while saving ground after the first quarter mile, Bejarano angled out approaching the quarter pole, wheeled seven-wide at the top of stretch and won with consummate ease. Fourth in a Grade III turf sprint in Kentucky Sept. 8, Storm the Hill was the second choice at 5-2 in a field of nine fillies and mares three and up and paid $6.80, $3.40 and $2.40. Owned by Alastar Thoroughbred Company, LLC and Michael Valdes, Storm the Hill, who is out of the Good and Tough mare Thornhill, banked $60,000 for the win, increasing her earnings to $338,735. Three for four down Santa Anita’s unique hillside course, she now has two graded wins and is now 23-5-1-6 overall. Ridden by Evin Roman, Painting Corners, in her first stakes appearance, was dispatched as the 8-5 favorite and paid $3.00 and $2.60 while finishing 1 ¾ lengths in front of Poster Girl. English-bred Poster Girl was off at 10-1 with Tyler Conner and paid $4.00 to show. Fractions on the race were 20.92, 42.39 and 1:05.97. Note: The Senator Ken Maddy is named for the late California State Senator, based in Fresno, who was a stalwart for Thoroughbred racing as both a state assemblyman and senator, beginning in 1971 through 1998.